Rest Assured We Know you will Love Tiger Tape-that's we offer a Lifetime guarantee, if for what ever reason you don't love it-send it back for a full refund. [Professional Grade Quality] --Painters tape: 6 pack of 1" inch 60 yards of grade A quality painters tape. [Clean Lines/ Easy Removal] --Sharp Lines and Narrow Edges and Removes cleanly with no left over residue. [Multi-Surface Use] -- Usable on a variety of surfaces: textured walls, trim, glass, metal. Great for automobile projects. 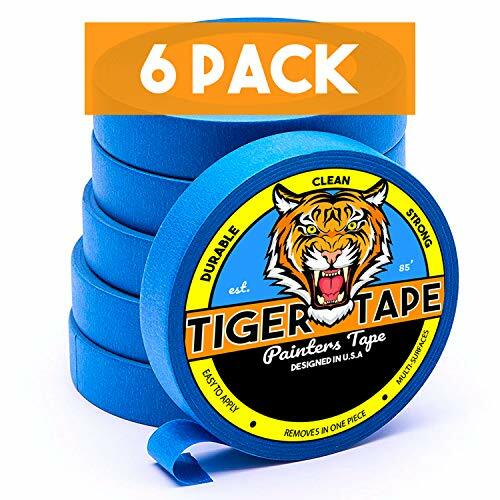 If you have any questions about this product by Tiger Tape, contact us by completing and submitting the form below. If you are looking for a specif part number, please include it with your message.